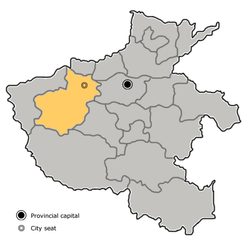 Mengjin County is a county under the jurisdiction of Luoyang City, in the northwest of Henan province, China, located to the north of Luoyang's urban districts. Mengjin began its life as an ancient ferry crossing for the Yellow River. According to legend, King Wu of Zhou crossed the Yellow River at this location, after forming an alliance with the other nobles, leading to the theory that the original name was actually (盟津; Méngjīn; 'ferry crossing of the alliance') rather than 孟津; Mèngjīn. According to this theory, it was only in later times that the character 盟 was mistakenly replaced by 孟. The ferry crossing was an important strategic location during times of war. In Chapter 6 of Romance of the Three Kingdoms, Cao Cao explains that part of his strategy in engaging Dong Zhuo's forces was for Yuan Shao's forces to take control of Mengjin (see: Battle of Xingyang). Hanyu Da Cidian 3.0 (in Chinese). Hong Kong: Commercial Press. 2007. ISBN 978-962-07-0277-8. This Henan location article is a stub. You can help Wikipedia by expanding it.